In April, 2004, several tipping can nest box traps were monitored with video cameras. The exterior cameras recorded all visits to the traps's perch. One camera also recorded the holding cage. Four camera feeds were recorded on a single vhs tape by use of a quad splitter. The date and time were also displayed on the screen so the exact time of each event was recorded. My original purpose was to see how often a starling would land on the perch, look in, but not enter the trap. The tipping can traps seemed to be working perfectly, and were catching many starlings, even though this year there were very few resident starlings in the yard - usually just 2-4 that were trying to nest in a location difficult for me to reach. With so few residents this spring, the traps still caught 111 starlings as of today (June 5, 2004). But, why did certain starlings not enter a trap? And, why did adding more traps greatly increase the number of catches? Were some starlings entering a trap and escaping and then avoiding that trap in the future. And, were they then being caught in a new trap at a different location? As soon as the cameras were in place, the first tapes yielded several surprises. First, it was evident that both the vocalizations and the sound of scratching of a starling in the holding cage carried up the 4" pvc downtube as if it were a megaphone. The cages were 15' to 18' below the trap, but, it sounded as if the bird were inside the trap. Were distress calls of a captive bird alerting others? And, would reducing the sound level carried up to the trap increase the multiple catch rate? One trap was modified so that trapped starlings would not be directly below the down pipe. See the results here. Another surprise captured on videotape was the escape of a starling from the trap. It entered the pvc elbow, allowing the balance beam to return to the set position and then reentered the trap box, climbed onto the balance beam and walked up the beam, causing the can to drop and exposing the entrance hole. This was only recorded once in several weeks of taping, but, is likely the reason that some starlings avoid a particular trap. A simple fix to prevent this was to fit a 1/4" plywood shield on the beam to prevent a starling from climbing on top of the beam. The extra mass added to the balance beam will theoretically make the response more sluggish, but it can still be balanced as lightly as before. 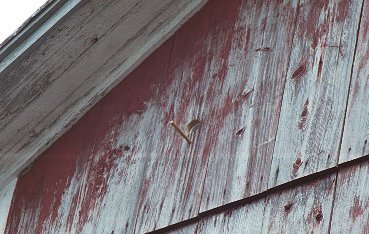 No starlings can escape through the entrance before the can falls, but the heavier the entire balance beam, the less effective it may be for house sparrows. Next year, when a new crop of starlings enter the yard, the modified traps should approach 100 percent efficiency, since no starling that enters one will escape and then avoid the traps. Of course, all good alternative nest sites must be blocked, to prevent a starling from nesting elsewhere without the need to enter a trap. This spring, one pair of starlings nested in a location very difficult to enter on the barn wall, within 30 feet in either direction of a nestbox trap. 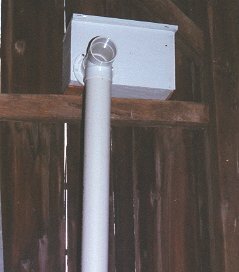 A 4" gutter downpipe that ran diagonally across the barn wall had pulled apart, leaving a narrow gap at the bottom. The pipe was not connected to a gutter, so no water ran through it. My guess is that this very acrobatic starling, choosing to claw its way into the pipe to nest was one of the trap escapees. However, starlings and house sparrows sometimes seek such hard to reach nest sites, perhaps for added safety from predators. The house sparrow that killed a female tree swallow on eggs in her nest box a couple years ago, then built a nest 4 feet back under metal flashing over the rolling barn doors. I discovered this nest site because of the loud noise of kicking and scratching on the metal flashing as he laboriously entered and exited the narrow tunnel. Perhaps he was afraid the other cavity nesters would retaliate if he used one of the vacant nest boxes. Another event captured on videotape involved a starling entering the trap and remaining in the can rather than entering the downtube. Two starlings were trapped within 5 minutes and 15 minutes later, two more arrived and began entering and leaving the trap at will, even bringing straw to build a nest. The can was in the down position and they were walking on top of it. The second starling to enter the trap had remained in the can for 15 minutes, causing it to remain in the down position! When he finally entered the PVC elbow, the trap reset and functioned normally. This has led me to begin replacing the perforated elbows with a T fitted with a lucite window. While the new T window exits work fine, no other instances of delayed exits with the elbows have been recorded, so I don't know how common it was. This bird likely remained in the can so long because she heard her mate in the holding cage below. 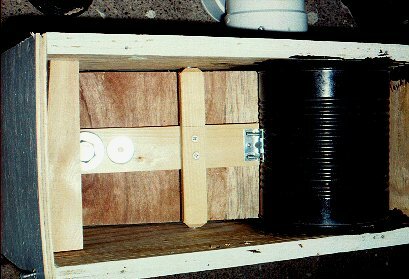 Video cameras were also installed inside a series of nest box trap prototypes, beginning with a simple baffle trap with no moving parts which proved a very interesting failure and culminating in a quite promising tipping floor/sweeping wall trap. The interior cameras were a great aid in showing how the starling reacted to each new challenge. Traps that were mounted high on a wall, just under the roof and near or on a corner of the building were, by far, the most attractive to starlings. One trap that was mounted half way up a wall and 30 ft from the nearest corner attracted no starlings in 4 weeks while the other traps, mounted high on or near corners were catching many. Also, I was surprised to find that the internal traps caught substantially more starlings than those mounted outside. The internal traps had a 2 1/8" entrance hole through the building wall and a small perch under this hole. External traps were painted white and resembled a large nest box, also with a 2 1/8" entrance hole and small perch. While the trap results varied from trap to trap, all internal traps performed better than all external traps. Each trap was, of course, in a different location, which would also affect its effectiveness. My pole mounted trap caught fewer starlings than any of the building traps, except the mid-wall trap which caught none. The orientation of the trap seemed unimportant. Traps on a north wall worked as well as those on south, west or east walls. A prominent perching area near but not too close to the trap will likely help. Electric lines enter the barn within 4 feet of my original trap, helping to make it the most productive site. Birds of many species, including starlings, use these wires as perches. Starlings used to land on the wires very close to the building, while bluebirds, swallows, and other native species would usually perch at least 20 feet away from the building. I use small perches on the traps so only one starling can land at a time. The entrance video showed two starlings frequently coming together. One would land and the other would swoop by, or, in some cases, displace the first bird and take over the perch. In either case, the 2nd bird remained nearby, because it usually landed on the perch within seconds after the first bird entered the trap. I can see no advantage in allowing the second bird to perch alongside her mate and see up close what happens to him. She would then be unlikely to jump in after him. &COPY; 2004 - 2009, American Artifacts and Richard Van Vleck, Taneytown, Maryland.